Our dogs are especially prone to a variety of skin conditions from flea bite dermatitis to skin infections and a whole lot more. While there are medications that can be given to relieve the symptoms, sometimes all that is needed is a good medicated dog shampoo. We’ve put together a short list of the 5 best medicated dog shampoos in the market today to help you determine the most appropriate for your pet. Sogeval’s Duoxo is a veterinarian-recommended dog shampoo that is formulated for the management of certain skin infections caused by organisms that are vulnerable to the antiseptic properties of Chlorhexedine. The addition of Climbazole in the formulation also extends the antiseptic properties of Duoxo by targeting susceptible fungal and yeast species especially those that cause canine eczema and dandruff. Phytosphingosine salicyloyl, on the other hand, is a kind of pro-ceramide that is formulated to provide additional control of symptoms associated with seborrheic dermatitis in dogs as well as other types of pyoderma. Duoxo not only kills susceptible microorganisms on your dog’s skin, it also helps nourish it and minimize itching, irritation, and other signs of skin inflammation. Pet parents who prefer to give their dogs a more natural approach to the management of various skin conditions can rely on Paws & Pals’ Natural Dog Shampoo and Conditioner. This medicated formula doesn’t come with lab-synthesized pharmaceutical agents that are typical with medicated shampoos for dogs. Instead Paws & Pals comes with a blend of 3 of the most effective natural ingredients when it comes to the reduction of skin inflammation, cleansing and nourishment of the skin, and facilitating the healing and regeneration of damaged skin secondary to bacterial, fungal, and yeast infections. While the antibacterial properties of rosemary essential oil may be modest at best, its anti-inflammatory properties are highly valued especially in the management of itching. Paws & Pals is the perfect adjunct to conventional treatments as it can help relieve itching while nourishing both the coat and the skin. 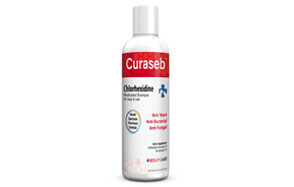 Curaseb has almost the same formulation as Duoxo, except that it contains Ketoconazole instead of Climbazole. Regardless, both are very effective antifungal and anti-yeast agents that can help your dog with its fungal and yeast infections. 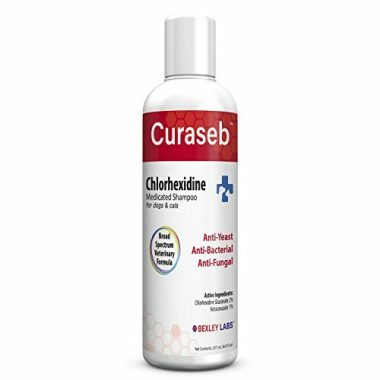 Curaseb doesn’t contain Phytosphingosine salicyloyl, however, and as such may not be as effective in the management of certain symptoms associated with seborrhea. Additionally, its Chlorhexedine content is slightly lower than Duoxo at 2%. Still, knowing that it has a broad spectrum of activity can sure give you the peace of mind you need in treating and controlling the various skin conditions of your pet. It does come with aloe vera, though so you can feel confident about improving your pet’s coat. If your dog is diagnosed with seborrhea due to certain fungal species, then you might want to consider SynergyLabs’ Veterinary Formula Clinical Care. Unlike Duoxo and Curaseb Clinical Care comes with Salicylic acid that is well-known for its keratolytic properties. This agent is what helps dissolve the various substances that are causing the cells of the skin to stick together. This also helps increase skin hydration which works exceptionally well with its other ingredient, allantoin. Clinical Care also contains tar and micronized sulfur which serve to improve the anti-seborrheic, anti-fungal, and anti-parasitic properties of Salicylic acid. The addition of colloidal oatmeal helps enhance the moisturizing and skin healing properties of allantoin while giving it exceptional relief from itching. The other good news is that Clinical Care can be safely used with topical flea treatments so you can be sure you’re protecting your dog from these pests while addressing its skin condition. 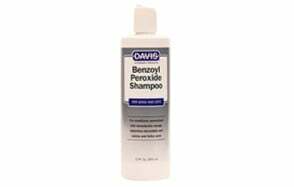 Davis Benzoyl Peroxide Pet Shampoo acts like Salicylic acid since it is also a keratolytic. In human applications it is especially used in the management of mild to moderate acnes. The same function can also be used in dogs. However, its principal effects are indicated in the management of the various skin manifestations of demodectic mange and seborrhea. Its Benzoyl peroxide formulation is suspended in a variety of natural oils to allow for a more effective cleaning of the skin, flushing out microorganisms and debris, and nourishing the skin to help facilitate healing and regeneration. The same formulation also serves as a natural degreaser so that excess oils will not further aggravate the seborrhea. Buying a medicated dog shampoo can be easy if you consult your veterinarian about which particular product to use or the active ingredient to look for. However, different brands of medicated dog shampoos can carry the same active ingredient with some opting to add a few other agents in their formulations. This can make choosing the best medicated dog shampoo quite challenging. But if you go through our buying guide and FAQ section, you’ll find that it really isn’t that difficult to zero-in on the best medicated dog shampoo. What is Medicated Dog Shampoo? As the term implies, these are types of hair (or coat) care products that contain substances designed specifically to treat or manage a certain health condition of the skin and coat. These can include skin inflammation, irritation, itching, dry and crusty skin, and even hot spots, among others. They are basically shampoos that you apply onto your dog’s coat, massage onto its skin, and leave it on for a couple of minutes for the active ingredient to exert its action. Like any other topical medications, there are certain things that you have to observe. 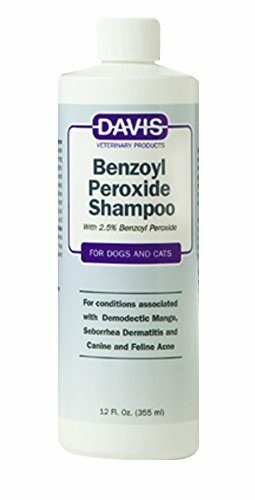 For instance, you’re only supposed to use these if there really is a condition on your dog that can be effectively managed by such a shampoo. Once the problem has resolved, you can stop using the medicated shampoo altogether. If you’re wondering what good is it to apply medicated shampoos on your dog, then consider the following benefits. Conventional shampoos are basically indicated for general hair care and grooming. Medicated shampoos have a more specific function. 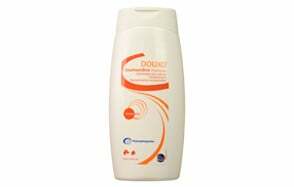 For instance, there are shampoos that are intended for the treatment of dandruff or even seborrhea. If your dog doesn’t have either condition there is no need to use the medicated shampoo. There are also shampoos that contain broad-spectrum antiseptics which can help kill a wide variety of microorganisms. While its broad-spectrum activity connotes a more general purpose, it can still be considered as addressing a very specific problem – that of microorganism-related skin and coat conditions. Since medicated shampoos are topical applications intended for superficial problems, the effects can be immediate. Unlike medications that still need to go through the dog’s stomach and absorbed through the blood to reach the target site, medicated dog shampoos provide immediate relief to your pet’s symptoms such as itching and skin redness. The main issue with oral preparations or even injectables is that their active ingredients do not only affect the problematic site; they also affect other cells that are susceptible to such ingredients. That is why the side effects of oral and injectable medications are more profound than topical preparations. For dog shampoos, it is very rare that you get a side effect since it only works on the outer surface of the skin. Unfortunately, if the medication does get into mucus membranes such as the eyes, the potential side effects can occur. To further help you gain a more refined understanding of the type of medicated shampoo that is appropriate for your pet, you’ll need to learn some of the more popular types of medicated dog shampoos. One of the clinical manifestations of seborrheic dermatitis is dandruff that is so stubborn that no ordinary shampoo can ever get rid of it. Dandruff is almost always accompanied by reddish skin and scaly patches on your dog’s skin. While it is not known what exactly causes seborrheic dermatitis, experts agree that it can be caused by certain species of fungus-like Malassezia which are typically present in the oil produced by your dog’s skin. In some cases, an abnormal response in the dog’s immune system can facilitate the proliferation of these fungal species. Antiseborrheic shampoos help by either killing the fungus that causes flaking in the skin or dissolving the various substances that stick these flakes onto the skin. These typically contain Salicylic acid, sulfur compounds, tar-based compounds, benzoyl peroxide, and selenium sulfide, among others. Some of these agents also serve as degreasers which can help reduce the severity of seborrhea. The skin is home to a host of bacterial species that are not really pathogenic as long as your pet’s immune system is able to strike a balance between the normal bacterial flora and pathogenic organisms. Unfortunately, in the event that your dog’s immune system is compromised, there’s a possibility that pathogenic bacteria will overwhelm normal bacteria. Additionally, in the presence of breaks in the skin even normal bacteria can turn pathogenic as they invade the deeper structures of your dog’s skin. Antibacterial shampoos are especially indicated in skin infections that are caused by susceptible bacteria. Chlorhexidine, benzoyl peroxide, and ethyl lactate are just some of the active ingredients of medicated dog shampoos with antibacterial properties. These do not exhibit specificity to certain bacterial species and are generally considered as antiseptics, fully capable of killing a greater number of microbial species. Like bacteria, fungi are also present on the dog’s skin. However, they often become pathogenic in cases of immunocompromised states. Fungal skin infections are best treated with imidazole-containing medicated dog shampoos. These substances interfere with the fungus’ ability to synthesize ergosterol which is a very important component of its cell membrane. Without this molecule, fungal species will not be able to mount an effective defense against immune system cells. Antipruritic dog shampoos are formulated specifically to help reduce the incidence and severity of itching. Traditionally antihistamines are provided to help relieve itching. However, there are now dog shampoos that contain colloidal oatmeal that works more like a magnet to pull the allergens from the surface of the dog’s skin. These allergens are some of the most common causes of itching because of the stimulation of pro-inflammatory substances. While this type of medicated dog shampoo doesn’t actually address a very specific skin condition in dogs, they are valuable in providing deep cleansing of the pores to remove dirt and debris that may clog pores. This can help prevent canine acne as well as seborrhea. Since one of the manifestations of canine skin problems is dry, scaly skin, the moisturizing effects of this type of medicated dog shampoo are also useful. You might think that ordinary dog shampoos also clean and moisturize the skin. The difference is that the cleansing properties of medicated dog shampoos are not attributed to the presence of soap. Hence, they are generally safer and gentler to your dog’s skin. Medicated dog shampoos are generally safe considering that they are topical applications. However, there will always be a few side effects that can be the direct result of the mechanisms of action of the various active ingredients. Here are some side-effects you should watch out for. Skin irritation and itching – these can be observed with tar- and coal-based dog shampoos and those that contain benzoyl peroxide or salicylic acid. Allergic reactions – these occur if your pet is hypersensitive to any or all of the ingredients of the shampoo. Your dog may show skin redness, itching, and others. Q: Why should I use a medicated dog shampoo? A: The only time you should use medicated dog shampoo is when your veterinarian explicitly recommends that you do. While these may look like ordinary shampoos, they do contain certain ingredients that can produce localized side-effects. So why should you use a medicated shampoo for dogs? First and foremost, it is highly specific for the management or treatment of a particular skin condition. Do take note that not all canine skin conditions have a specific medicated shampoo, so it’s best to always consult your vet. Secondly, you get to see the effects almost instantaneously. If your pet is always scratching, you’ll notice the frequency of scratching to be somewhat reduced several minutes after shampooing. Thirdly, the active ingredients included in the formulation of such products are all proven to be effective in their respective indications. Just make sure you understand the type of medicated dog shampoo that is ideal for the type of skin condition that your dog has. Q: How can I properly use a medicated dog shampoo? A: Using a medicated shampoo on your dog is pretty straightforward with a few minor modifications to your regular dog shampooing routine. Depending on the skin condition of your dog and the type of medicated shampoo you are going to use, you can either apply it all over your dog’s coat or just on the affected area. Regardless, the procedure is essentially the same. Wet your dog’s coat making sure that the water reaches well onto the surface of its skin. It is best to use warm water to help open up the pores of your pet’s skin. Apply your medicated dog shampoo and massage it well onto your dog’s skin. Leave it for about 5 to 10 minutes or whatever manufacturer’s recommendation is. Thoroughly rinse your dog’s coat. Now some products may require you to leave the coat as is to allow for sufficient time for the medication to reach its intended targets before you eventually dry the coat completely. Depending on your vet’s instructions, you may need to repeat the application several more times or give your dog its medicated shampoo every other day. It is important to adhere to your vet’s instructions. Dog medicated shampoos are highly-specific dog care products that address certain skin conditions in dogs. They help relieve itching, dandruff, irritation, redness, and many more. This can help your pet feeling a lot more comfortable. That’s why it’s crucial that you know how to choose the best-medicated dog shampoo for your own hound. For a great selection of standard products, be sure to read our review of the best dog shampoo.